Water tanks are important in every house and most houses install tanks random in direction wherever it is suitable. However water tanks have their own place and direction where installation of water resource is consider ideal. Vastu tells some ideal directions to place water resource for better health, wealth and prosperity in house. 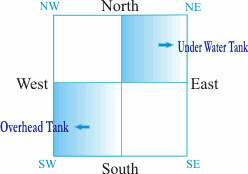 Water is an important element in Vastu and if its placement is not accordingly then it creates problems for occupants. Underwater tank should be dug in North-east direction while before digging a sump draw an axis marking from North-east to South-west while both the sides right or left are apt for underwater tank. North-east is an important place in home which is held scared due to which it should be left vacant as much as possible and that is why underwater tank is recommended here. Avoid any water source/tank towards North-west or South-east. Over-head tank should be installed in South-west direction only because South is inauspicious corner of house where heavy things can be placed to equate the energies. Over-head tank in this direction balance energies to bring health, prosperity and all-round peace. Avoid over-head tank in North-east as it leads to unnecessary expenses and losses.